Annelise loves meeting new people every day. An outgoing and energetic nature combined with a positive outlook on life makes Annelise a perfect fit for her role as a Business Development Manager. 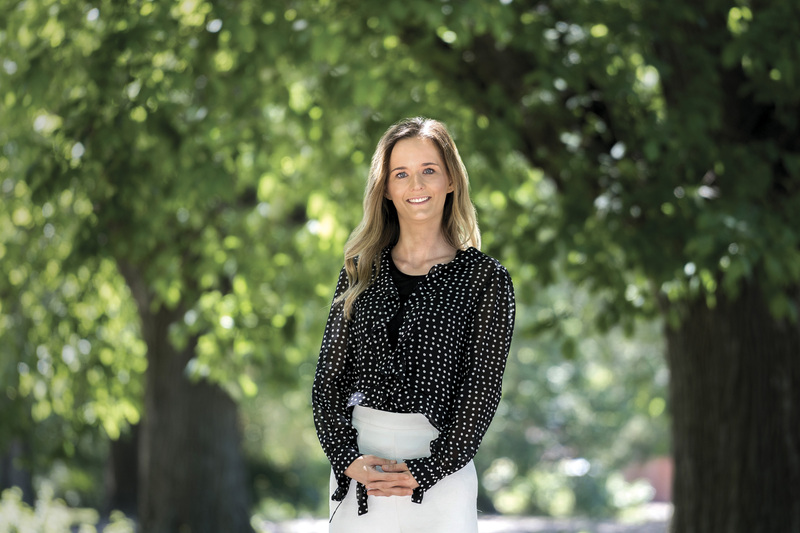 Having commenced with Marshall White One straight out of VCE in 2015, she has been named their rising star in 2016 for excellence in Property Management, finalist in RER Network Property Management Rising star and most recently, Marshall White One’s Property Manager of the year, 2017. Annelise purchased her first investment at age 20, giving her intimate knowledge of leasing and managing properties from both sides. Her focus is on excellent customer service through going beyond the minimum expected, an emphasis on upfront communication and a confident approach defines every decision she makes. Away from work, Annelise’s time is spent catching up and walking with friends, pursuing her interest in interior design and completing her own furniture restoration projects. Thanks again Annelise, it really is lovely to have such a terrific, helpful and thorough property manager… a huge step up from the previous agency I used which is enormously appreciated. I would very much like to thank you for looking after our house. You have been a fantastic help and I wouldn't hesitate to recommend your services to anyone. Hi Ashlee, I recently leased out one of your properties at 412/862 Glenferrie Road Hawthorn. I had the pleasure of dealing with Annelise. She is an employee I wish I had when i was in business. She was professional, and understanding. Put simply dealing with Annelise was a great and she is a wonderful person. Make sure you don't let her go, people like her are hard to find and almost impossible to replace. I'd just like to thank you for all of your help throughout our time at Collings Street. Rohan and I really appreciate how respectful you have been of our needs, your constant prompt responses, and how smoothly you have handled the sale of the property. I wish you all the best in the future. I've recently ended my property management with MW1. It's been a good run and I'd like to acknowledge & commend the professional property management services I received from Annelise Robinson. I revert back to when I began I began with MW1 - I had come from another property management company. It wasn't a good experience at all; plagued with poor rentals, lack of follow-up of reference checking with new applications and as outcome, property damage. Since then with MW1, I have been continually and consistently impressed. I have a multitude of Property Managers and all have been excellent. The three standouts were - Craig Fellowes, Jessica Adams and Annelise Robinson. I have found Annelise to be professional, polite, well spoken, accountable and very efficient with all my requests & enquiries. She has always directed back to me to legislation when I've questioned her and her quick response to co-ordinating pending issues has helped to resolve matters with the tenants so much sooner with no negative impact. Most of all she has been pleasant to deal with and has a very dedicated & enthusiastic attitude to her work. Given I have had such a positive experience I wouldn't hesitate to recommend MW1 services. Thank you to Annelise & MW1. I hope this email finds you well. I write to you today to express my most sincere appreciation for your support in the last couple of weeks. The process of lease transfer and everything else that comes with it is troublesome in itself. When you add a very complicated and explosive break-up to this mix it then becomes unbearable and dreadful. However, with your constant support and prompt, clear responses – even when you had to take time off due to illness – the process seemed seamless and achievable. I literally started expecting a response from you in less than an hour every time I emailed you or called you, and not once did you disappoint. When you had to deliver not so friendly news your tone and professionalism made it seem like a tiny bump rather than a gaping pothole. You even served as an intermediary between me and that crazy woman I made the mistake to date. You have truly gone above and beyond the call of duty and for that I am forever grateful. So thank you very much, Annelise. I sincerely hope my next agent does a job at least half as good as yours. I might try to convince you to change agencies to whatever agency I move to next. Thank you ever so much again for all that you have been to us and for being so prompt, professional and courteous in all your dealings with us. Compared to most other people we have come across is similar roles, you most certainly come out at the very top and are in a uniquely special class by yourself with no close second. You have our permission to retain our contact details in your personal records and please feel welcome to pass them to anyone who wishes to obtain a professional reference about you from one of your clients. Thank you ever so much again for all that you have been to us and for being so prompt, professional and courteous in all your dealings with us. Compared to most other people we have come across is similar roles, you most certainly come out at the very top and are in a uniquely special class by yourself with no close second. You have our permission to retain our contact details in your personal records and please feel welcome to pass them to anyone who wishes to obtain a professional reference about you from one of your clients. With Our Best Wishes for GOD’s Every Blessing Upon You! I just wanted to say a huge thank you for everything you have done so far with regards to our rental. We have found your level of service outstanding and we feel the way you handle everything has made this whole process seamless. You are a pleasure to deal with. Thank you for all your assistance Annelise. You have always been professional, friendly, helpful, and easy to deal with. You have set a challenge for others to match your service levels. Just as an extra note, I really appreciate all your hard effort over the last 12months. Particularly in the first few. You have definitely made my life 1000 times easier and that is worth its weight in gold to me. Both Arthur and Denise have spoken volumes and I will definitely not hesitate requesting you in the future for any of our property needs.